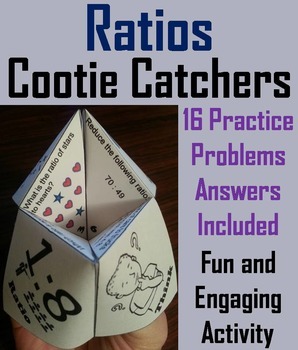 Ratios: These ratios cootie catchers are a great way for students to have fun while they practice their skills with ratios. How to Play and Assembly Instructions are included. 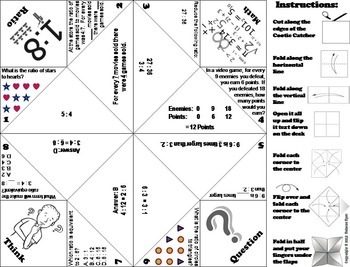 There are 2 cootie catchers in this product, each one having 8 problems for a total of 16 problems. 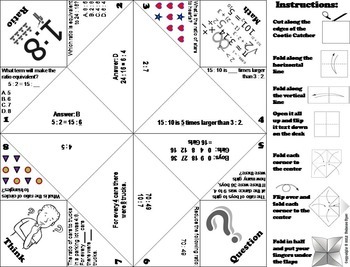 Each cootie catcher has problems which involve equivalence, word problems, reducing ratios, and determining ratios from patterns. 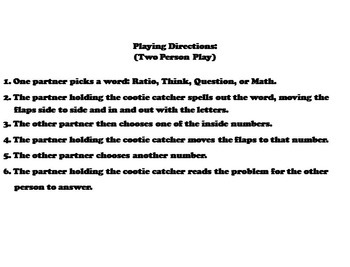 Answers to each problem are included. Grades 1-3: Get all 19 (35% OFF) in the Bundle! Grades 3-5: Get all 39 (50% OFF) in the Bundle! Grades 6-8: Get all 14 (35% OFF) in the Bundle! Geometry: Get all 16 (35% OFF) in the Bundle! Algebra: Get all 18 (35% OFF) in the Bundle! Games-------------- Jeopardy, Money Wheel, Are You Smarter Than a 5th Grader? Copyright © 2015 Science Spot. All rights reserved. This purchase is for you and your classroom. Duplication for an entire school, an entire school system, or for commercial purposes is strictly forbidden. Please have other teachers purchase their own copy. If you are a school or district interested in purchasing several licenses, please contact me for a district-wide quote.